RiffBox uses a patent applied for algorithm that creates perfectly timed loops every time. Traditional loopers require you to press a footswitch at the right time to get glitch-free loops. With RiffBox, your loops can easily be timed to your playing. You can even start loop playback without the press of a footswitch! Of course, if you want to time your loops to the footswitch, external audio signals or MIDI sequencers, RiffBox has options for that as well. All this for only $319! RiffBox contains 77 operating modes and other settings that can be saved in 100 preset locations. The factory presets provide a good starting point for almost any type of loop that you want to create. You can manually add layers to a loop, automatically add multiple layers, fade loops, automatically end loops, play loops back in reverse or play loops back at half speed. These are just some of the operating modes available. You can control RiffBox in a variety of easy ways including a built-in footswitch, a remote footswitch, or with MIDI program change messages. If you use a MIDI setup or effects pedal, you can control loop recording with the same footswitch that changes your amplifier setting or effects. This means that you can control loop recording and playback with no more footswitch presses than you would normally use. How simple is that? Synchronizing an external MIDI drum machine to your loops is just as simple. The length of the loop recording can be timed to your playing rhythm or to a note pitch using a patent applied for algorithm. RiffBox can automatically detect repeated playing patterns to create a loop either based on your playing rhythm or your note sequence. You can operate RiffBox like a traditional looper with the start and/or stop of loop recording timed to the footswitch. The start and stop of the loop recording can be timed to the pitch of a note that you play. You can add layers to loops or undo layer recording with the press of a footswitch. Unique delay effects can be achieved that are timed to your playing. 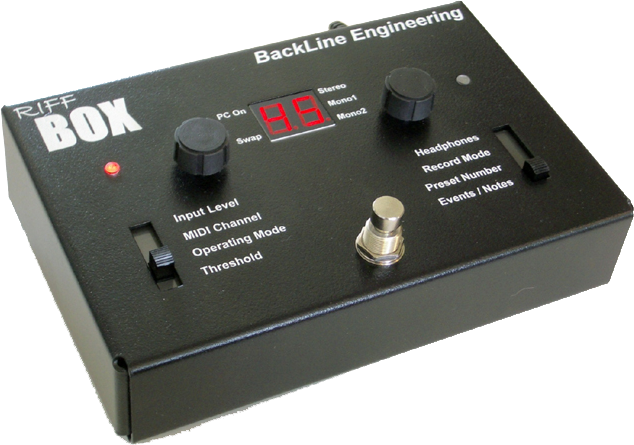 77 different looping modes including automatic layering and automatic fading. Store up to 100 configurations as presets. 16-bit stereo or 16-bit mono recording modes, both with 48KHz sampling rates. Up to 40 seconds of recording time in stereo or 80 seconds in mono with high audio quality. Full MIDI implementation including program change messages, continuous controller messages, MIDI 'note on' messages and sysex data dumps. Recording and playback can be controlled using MIDI program change messages, an external footswitch or a built-in footswitch. Swap mode allows a mono loop to play back out of left channel while you play along through the right channel. A mono input can be sent to both the left and right channel outputs. Half speed playback mode for learning complex recorded passages. Reverse mode for unique playback effects. Toggle between normal, reverse and half speed modes during playback using MIDI. Since RiffBox remembers when you play the notes within a loop, you can change the length of the loop during playback timed to the notes that you played using MIDI. Multiply the length of the loop during layer recording. Doubling mode that adds a fuller sounding loop playback. You can synch an external drum machine to your playing during loop playback. Can download firmware updates to protect your investment.